The yoga school in Bali, the teacher training course will take you on the journey of personal and professional self-development. They have a course that is designed to meet the prerequisites of yoga. Those yoga practitioners who have been doing yoga for at least one or two years should join this course to discover more depth in their practice. The accommodation offers guests a tranquil, rejuvenating, home away from home experience. The room has its own bathroom, porch overlooking rice fields. You also get free access to Wi-Fi. The bedroom is spacious and is fitted out with all that you will need including a comfortable single bed. Additionally, each room has its own private bathroom with all modern western facilities. In yoga school in Bali, the teacher training course will take you on the journey of personal and professional self-development. They have a course that is designed to meet the prerequisites of yoga. Those yoga practitioners who have been doing yoga for at least 1-2 years should join this course to discover more depth in their practice. 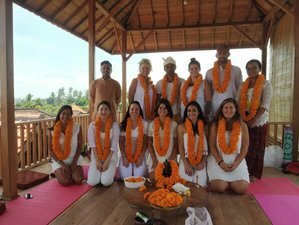 Bali Yoga School accept a maximum number of 10 to 15 students in the course. They ensure that the class should be conducted in pious environment and good enough to offer you a dynamic, engaging and holistic experience. The whole yoga teacher training course is in English. You should have at least a minimum understanding of English. Bali Yoga School has explored the Yoga Teacher Training Programs including the 200 Hours Multi-style Ashtanga/ Hatha/ Vinyasa flow Yoga Teacher Training program in the exotic destination of Bali. During the course of training, students will get to learn many new things about yoga. Comprehensive & deep study of postures anatomy, movements and the key systems of the body. Learn how the body parts work and apply this knowledge for safe and effective practice and teaching. The course includes a deep practice of asanas (postures), Ashtanga yoga, vinyasa flow as well as its theory. Students are with also provided a separate class on alignment - adjustment - teaching methodology as these are part of the training, this class gives enough time to students to interact with their teachers and find out the answers of their questions. Yoga philosophy in Sanskrit called yoga darshan which means guiding students through philosophy of life with the help of ancient yoga texts to the aim of yoga. 200 Hour Course at vinyasa yoga school imparts teachings of the mystic sage Patanjali’s ‘Patanjali yoga sutras’ which teaches students to learn how to live an appropriate life. Mantras: sound vibrations that permeate every cell of your being and allow your mind to dissolve and repose. Meditation is that which gives you deep rest. Meditation is an activity in which the practitioner just sits and allows the mind to dissolve. The rest in meditation is deeper than the deepest sleep that you can ever have. When the mind becomes free from agitation, is calm and serene and at peace, meditation happens. The “prana” creates an aura around the body. It flows through thousands of subtle energy channels called ‘nadis’ and energy centers called ‘chakras’. The quantity and quality of prana and the way it flows through the nadis and chakras determines one’s state of mind. If the prana level is high and its flow is continuous, smooth and steady, the mind remains calm, positive and enthusiastic. Ayurveda is ancient knowledge that indicates the very measure of life, advising on the appropriate and inappropriate, happy and sorrowful conditions of living, and recommending practices auspicious for longevity. On 1st week: introduction to Ashtanga yoga followed by Sun salutation A & B. On 2nd week: standing sequence postures & use of yoga props. On 3rd week: seated sequence postures & finishing sequence postures. On 4th week: Mysore style & teaching practice. 200 Hour Certificate will be awarded on completion of all course requirements. This certificate is all you need to immediately apply for your Yoga Alliance RYT200 Certification, a certification recognized worldwide. 1. Course manual is provided to students during the course. Himanshu ji is one of the accomplished yogi of 21st century, he is very simple man, living with basic needs. The aim of his life is to educate people in yoga sciences because like many other accomplished yogis the wisdom he acquired through yoga sadhana, he considers himself a mean selected by the supreme being to spread yoga wisdom in the world. He is pursuing master in Yoga sciences (Best yoga teacher in bali). Yogi ajay ji is born for yoga and as a guru to all Bali Yoga School yogis, he considers his dharma, religion is to provide right direction and guidance to all walks of life people whoever comes to him for his help whether economically or health related. He is the light, consciousness of all consciousness, soul of all souls, our words can not completely describe who is yogi ajay ji, ones have to meet him (Best yoga teacher in Bali). Yogini Praveen ji is very experienced teacher of Meditation/ Philosophy/ Healing , her teachings are very natural that comes directly from her heart and it helps students to see their true blissful nature. Praveen ji has leaned yogic teachings from many great indian masters and her life’s aim is to spread her masters massages through her teachings. Yogi Pradeep ji is very well know master of Ashtanga Yoga/ Vinyasa flow/ Alignment, Pradeep ji has completed his master degree in yoga sciences as well as he has more than 2 years of teachings experienced in the path yoga, he loves guiding people on the path of yoga. Yogi Ram Ji is one of the most talented Hatha yoga/ Ashtanga/ Vinyasa Flow Master, very Experienced, as well as knowledgeable, students love his teaching style, he is very inspiring & Motivational. The venue is nestled in the rice fields and is a short 10-minute ride to the popular surf beaches of Bali. There is a luxurious garden area, yoga shala and meditations hall, kirtans, and crystal bowl healings. Bali Yoga School is one of the prominent yoga schools in Bali that offers you a traditional natural wellness journey in the mesmerizing environment of Bali.